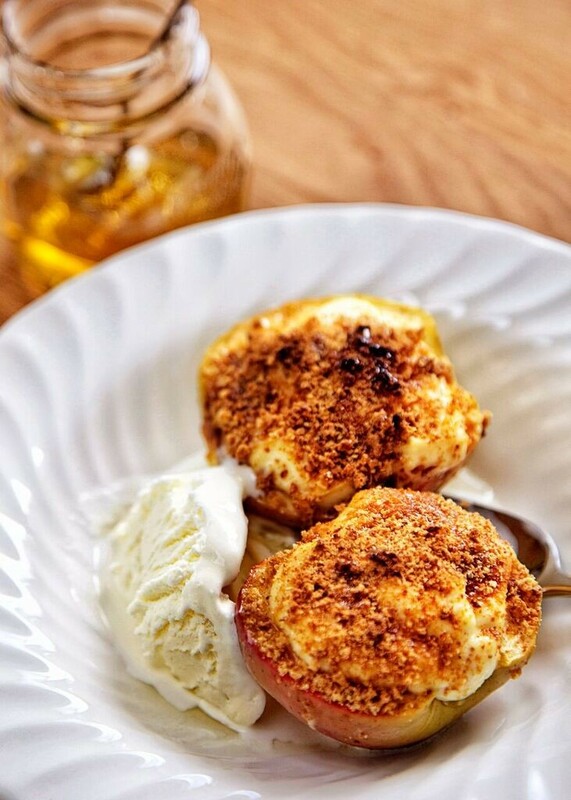 Amaretti & ricotta turn an everyday pud into a special treat. Wash the apples. Cut them in half and remove the core with a sharp knife. Place the apples in a shallow ovenproof dish. Put the amaretti biscuits into a clear food bag and crush them coarsely with a rolling pin. Grate the lemon for the zest and squeeze it for the juice. Mix zest and juice with the ricotta. Spoon the ricotta mixture on to the apple halves. Drizzle them with honey. Put the apples in the oven and bake for 10 minutes. Remove the dish from the oven and scatter the crumbled amaretti biscuits over the apples. Return the dish to the oven and bake for another 10 minutes or until the apples are soft and the biscuits have turned a golden colour.